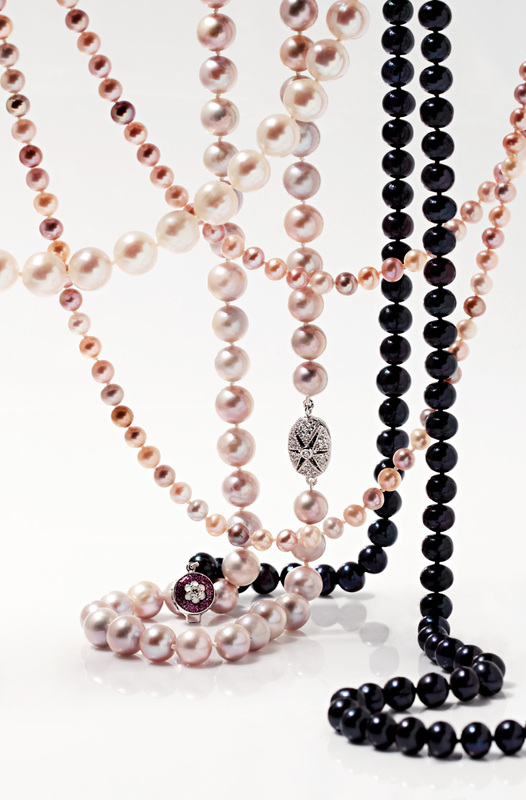 Pearls are extremely vulnerable to acids, alkalines and extremes of humidity. To preserve their radiance, avoid coming the pearls into contact with cosmetics, hair spray and perfume. Always put on your jewellery as a final touch, after applying make-up and styling hair. The pearl’s luster can also be harmed by perspiration. To prevent this, before returning your pearls to the jewellery box, wipe them gently with a soft cloth. Be careful not to dip pearl strands in water as water can weaken the silk thread. The thread may get dirty or stretch. Even if you don’t wear your pearls often, we recommend that you have your pearls restrung every year. It is also best to avoid direct sunlight or high temperatures. Pearls are exceptionally cohesive and shock-resistant, but may be scratched by contact with sharp objects therefore you should keep them in a box. If the radiance of your jewellery appears to be diminishing, take it to a specialist. COLLAR 30–35 cm – often worn as a tight two- or three-row necklace, perfect for V-shape decollete. CHOKER 35 – 40 cm – one row of pearls, classical length, resembling Collar, but lying more freely around the neck. PRINCESS 40 – 45 cm – the most popular necklace, which is always in demand, looks beautiful with any style of clothes. MATINEE 50 – 60 cm – such length adds nice touch to your style, it is also suitable for the conservative women who want to stay elegant. OPERA 65 – 85 cm – glamorous and essential part of the party dress, one or two ropes look equally wonderful. ROPE – 115 cm or longer – such necklace can be wrapped twice or more around the neck. Hidden clasps allow you to divide a necklace and make it shorter. Want to be informed about special offers? Join our newsletter! © 2015 HOYA PEARLS OÜ | info@hoyapearls.com | All rights reserved.